During the construction of the pier cap (bent) for the southbound bridge (over the FEC Railroad/Dixie Highway) of the US1 (SR5) widening project in Indian River County, exposed reinforcing steel was observed after removing concrete forms along the bottom of Pier 2SB. 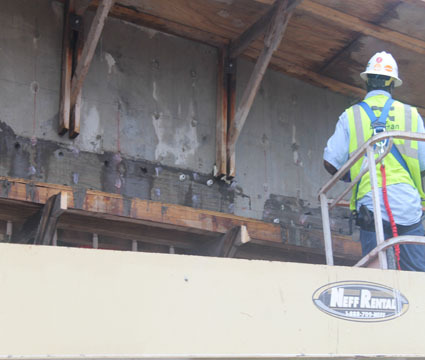 Engineers for the project requested non-destructive testing to be conducted to evaluate the concrete around the bottom layer of reinforcing steel for any under consolidated (honeycombed) concrete. Ardaman mobilized to the site to perform ultrasonic pulse velocity testing in accordance with ASTM C597, Standard Test Method for Pulse Velocity through Concrete. 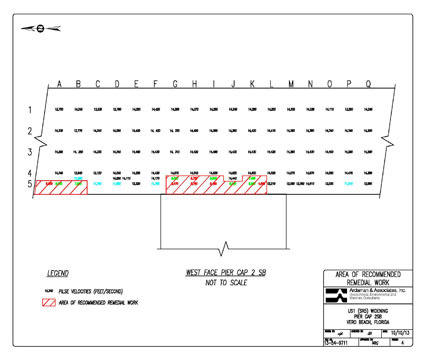 A grid pattern for the pulse velocity testing was established in the areas of concern on the pier cap. 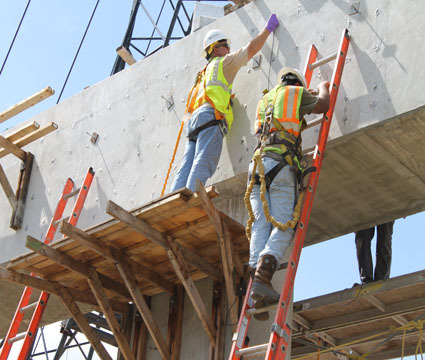 Using American Concrete Institute (ACI) Manual of Concrete Inspection, Publication SP-2 the qualitative description of concrete quality was determined by pulse velocity measurements. Based on the completed testing it was our opinion that the most of the tested concrete areas exhibited good to excellent quality with no indicated anomalies such as cracking or voiding. Areas near the bottom of the element, where the pulse velocity data indicated poor to very poor concrete quality, were flagged for remedial work. Ardaman remobilized to the site after repairs had been completed to retest the affected areas. The retesting indicated no anomalies, confirming the effectiveness of the repairs.